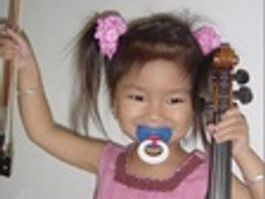 The Tutti Dolce program is the first subsidized multi-district Suzuki Pre-Twinkle Violin Program open to all students ages 3-5 attending the SCUSD, FCUSD, EGUSD, and NUSD commencing September 2014. Classes are conducted in rotating Guest Artist Residency Sessions and are included as part of SPAC's comprehensive Tutti Dolce curriculum. 1. Rest Position 2. Stance, focus, endurance 3. Listening skills, attention, habits 4. Sidedness 5. Following directions, quickness 6. Opposites (high-low, loud-soft) 7. Posture 8. Bow hold 9. Heavy head holding violin 10.Rhythms 11.String names and pitches 12.How to bow 13.Basic E string posture 14.String crossing, E and A string 15.Bow control, tip control 16.Relaxed, natural weight of bow arm 17.Square of the arm 18.Bow held silently on string 19.Stop form bowing on middle of bow 20.Left hand shape 21.Finger numbers 22.Finger patterns 23.Preparation fingers 24.Quick placement of fingers25.Soft left thumb/ relational left fingers 26.Coordination of bow and fingers 27.Pizzicato partners 28.Kreisler highway 29.Tonalization 30.Care of instrument and bow 31.Practice Skills 32.Memory skills 33.Entire 5 rhythmic patterns of the Twinkle used in the Suzuki Method. 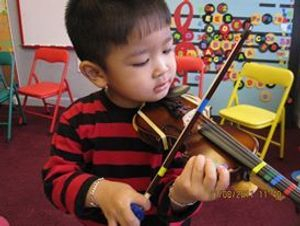 Staff: Teaching staff for each classroom of the Tutti Dolce program consists of a Suzuki Master Teacher, a Suzuki Apprentice Teacher, an AmeriCorps Classroom Assistant, and Suzuki Parent Teachers.